Lutz Trenkner is anxious to return to his passion of cycling, following recent surgery. Even at 70 years of age he remains energetic and sprightly. He lives with his wife Ursula in a tidy fifth floor apartment in a quiet suburb of West Berlin. He is a gracious host, and through broken English, offers coffee and pastries to his guests. His wife Ursula is at work we are told. While the couple have shared a traumatic experience, Lutz is willing to speak about the harrowing events, but for Ursula the memories remain too painful and private. Lutz was born the youngest of three brothers in a small town in central Germany in 1943, at a time when Hitler’s Nazi regime was still rampaging its way through Europe. Following the Allied victory against the Nazis in 1945, US troops were billeted on the Trenkner’s farm. A post war agreement between the Allies led to Germany being split between east and west. The new German Democratic Republic (GDR) would control the east while Allied forces took possession of the newly formed West Germany. As US troops left the Trenkner’s farm they urged the family to return with them to the west. But as the local doctor Lutz’s father Hans was reluctant to leave his patients. It was a decision which would have far reaching consequences for his sons. In 1959 Lutz’s eldest brother Ernst moved from east to west Berlin. Lutz and a third brother, Henning, were still teenagers and too young to follow Ernst across to the west. Within two years the escape route to the west was closed when the communist regime suddenly erected the Berlin Wall. “My thoughts were always that I would certainly join my brother (Ernst), but the possibility left me,” Lutz now explains. A reluctant Lutz settled down to life in a communist regime which he increasingly despised. He qualified as a car mechanic and later as a teacher. In 1978 compulsory military education was introduced into all schools in the GDR. Lutz was not a willing teacher of the mechanics of war. “Children had to learn weapons, shooting, what do I know about that kind of thing? “My feelings towards the GDR were negative at that time. “As a teacher I was required to lie continually. That was a process that lasted years. In 1983 the Trenkners applied to leave the GDR and move to the west. However, even the contemplation of leaving the GDR was looked upon with extreme displeasure by the state and the Trenkners’ repeated applications to leave were firmly rejected. What the school teacher could not have known was that his desire to disown the GDR meant he was now a target for the Stasi secret police. “I was always in contact with my brother (in the west), and he visited me regularly. “We were a bit naive in that he would send friends to visit me, who were working in the diplomatic service at the American Embassy. It would take another decade and the collapse of the communist regime before Lutz could discover the extremes to which the Stasi had gone to spy on him and his family. He would eventually discover that Stasi officers had copied a door key belonging to the couple’s son while he was at sport’s class and used it to break into the house and plant listening devices. At the same time other secret police established a spy post opposite the house to observe every time a family member entered or left the home. On the morning of February 16, 1984 Stasi officers finally arrested Lutz and Ursula Trenkner at their home. It would be the last time that the couple would experience freedom in the GDR again. They were separated in prison for months. The Stasi interrogation of Lutz lasted all night. He recalls how he thought that his wrists would be crushed by a Stasi officer’s over enthusiastic use of handcuffs. For the next three months he did not know what had happened to his wife or where she was being held. One day listening out his cell door he heard a cough which he immediately recognised. “One day in April, I heard people running very loudly. I knew from the noise that the people running were definitely women. I heard a cough and recognised my wife. “I coughed through the divide and she coughed back and we knew that we were both alive. In May 1984 the couple were convicted of consorting with enemies of the GDR state. Lutz Trenkner was sentenced to 20 months in jail, while his wife was handed a 15 month prison term. The mild mannered schoolteacher admits that living conditions in the male prison were bad, but says that conditions in the female prison were much worse, with more than 40 women sharing each cell. “I was a lot luckier compared to what my wife experienced,” is all he will say. Five months into their sentence the couple were unexpectedly put on a bus with other inmates and secretly spirited out of the GDR. The expatriation only took place after the West German government agreed to pay a secret “ransom” to the GDR for the release of dissident prisoners. “This (transfer) was secret and wasn’t meant to become known, because it was trading in human beings. “The GDR was always trying to get West German money, to buy western things. “They came to a deal whereby East German political prisoners could be bought free. Soon after the Trenkners arrived in west Berlin they were joined by their son, and the family watched in disbelief as the GDR began to disintegrate before their eyes. While 1989/90 saw the fall of the Berlin Wall and the beginnings of the eventual reunification of Germany, for Lutz there were still too many unanswered questions. Throughout its 40 years in existence the Stasi had 274,000 informers spying on friends, neighbours and family in the name of the state security of the GDR. Some had become Stasi agents for ideological reasons, others informed for money, while others are thought to have been coerced through fear and threats to betray those closest to them. Over two decades later Lutz continues to read his Stasi files trying to understand what happened, and why. 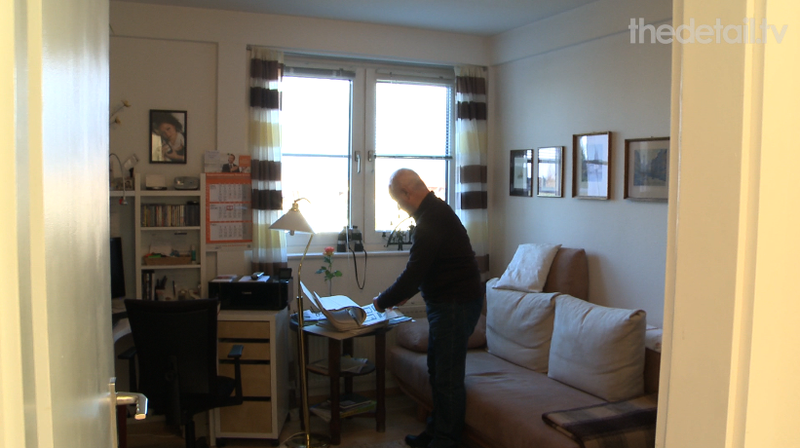 The desire to know who had betrayed him and why, led to Lutz applying to the Stasi Records Agency for access to the files which the secret police had held on him for nearly 30 years. He recalls the sense of nervous anticipation as he finally sat down to read the secret police files which laid bare the spying operation on his family. He could now finally discover the truth as to whether or not friends and work colleagues had betrayed him. To Lutz’s horror he discovered that the agent who had spied upon him for all those years was his own brother – Henning. Armed with the evidence, Lutz confronted his brother. “We were sitting in my flat. He wouldn’t admit to it, but he wouldn’t deny it either. It was an uncomfortable conversation. I didn’t speak to him after that. Despite 24 years having passed since he uncovered his brother’s secret, Lutz still finds it hard to forgive. There are many reasons why people became Stasi agents. The Detail contacted Lutz’s brother to hear his account of how and why he became involved in the Stasi. Despite the human pain of discovering his brother’s role, Lutz insists he has no regrets about reading his Stasi files. Twenty-four years on he often sits in his tiny study at night re-reading the Stasi files trying to understand what happened, and why. In Northern Ireland the Haass report recommended an information recovery process for victims in Northern Ireland. But does Lutz believe that it is a good thing, or could there be more painful exposures? “The German mentality may be different from the Irish one. “I think a reappraisal of the past is always a good thing. “People had fears about opening the files that didn’t come to pass. “I think it’s important for history and for the future, for our descendants.